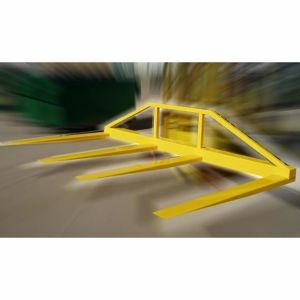 Spreader beams are designed to offer uniformity of centre of balance and centre of load to the forklift which is carrying the load. The load carried should be evenly distributed over the four forks of the spreader beam. The spreader beam slides over the standard forks fitted to the forklift until the retention pins can be positively locked into place. The maximum load length permitted, is the length of the spreader beam plus 40%. The lost load on all beams is 150mm. We have 7 models your load and the forklift you are using will dictate the model that is correct for you. The standard finish applied to the product is "safety yellow" enamel paint. Structural design and material selection for this attachment is in accordance with AS2359.1. Welded fabrication of this product is in accordance with AS1554.1 SP.